Take a couple who struggle with infertility being told they have run out of options, add a small town that makes pencils which just might be closing its factory and a dash a magic and you get The Odd Life of Timothy Green. The sleepy town of Stanleyville with under 2000 residents and a pencil factory that is clearly the only thing keeping this town on the map. 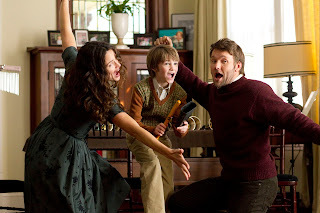 Jim (Joel Edgerton) works at the factory and his wife Cindy (Jennifer Garner) at the historic pencil museum in town. The have been trying for years to conceive and just can't. That night after much heartache and tears in order to help his wife move forward Jim decide they should write a list of qualities their perfect child should have. Several sheets and a bottle of wine later they have got to a good healing place, take all of their notes put it in a box and bury it in they vegetable garden out back. A freak rainstorm occurs that night and out pops a mud covered Timothy A cute 10 year old. What happens next is how they learn that parenting is not anything like what they expected and that the lives of those Timothy touches will never be the same. The qualities they put in that box start to come out and they realize just how these things fit into their life and those around them. Timothy's magic which goes through the leaves on his ankles helps people find inner peace with themselves. David Morse is well cast as Big Jim who has a very fragile relationship with his son. Common plays the rough kids soccer coach who talks about himself in the 3rd person. And there's Joni the local girl who Timothy falls in love with and manages to get her to embrace that she's different and loosen up. Ron Livingston is also in the film as Jim's boss, who seems nice in the beginning but you realize he's a bit slimy. There's no real villain in this movie but its an original story about how sometimes the thing you want more than anything is given to teach you a lesson not to satisfy that want. There are even some finny moments. The scene with them singing Lowrider is hilarious. The movie is about their life with Timothy, as it is being told to the adoption workers who are considering their application. The story retelling is not only heartwarming, when you know its Timothy's time to go its gets you right in the gut even though you knew it was going to happen they really pull out all the stops to get you to tear up. I give this movie a matinee. I really liked this film, yes even my frozen heart can melt a little bit. If you are a parent this movie will get you, so be prepared for that, its touching and even with the magic still is somewhat realistic enough. Having that seeking for approval parent, the competing sibling with the perfect kids, the boss you can't stand no matter how hard you try, its still one of those movies that you just get. 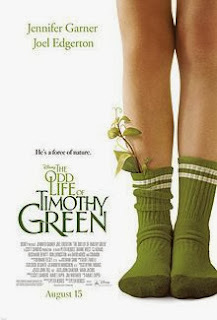 The Odd Life of Timothy Green is rated PG. It clocks in just over 2 hours and is in theaters August 15th.